TORONTO, April 19, 2018 – Horse racing fans will get a chance to scope out a handful of Queen’s Plate hopefuls in Sunday’s stakes action at Woodbine, which launches its new season this weekend. 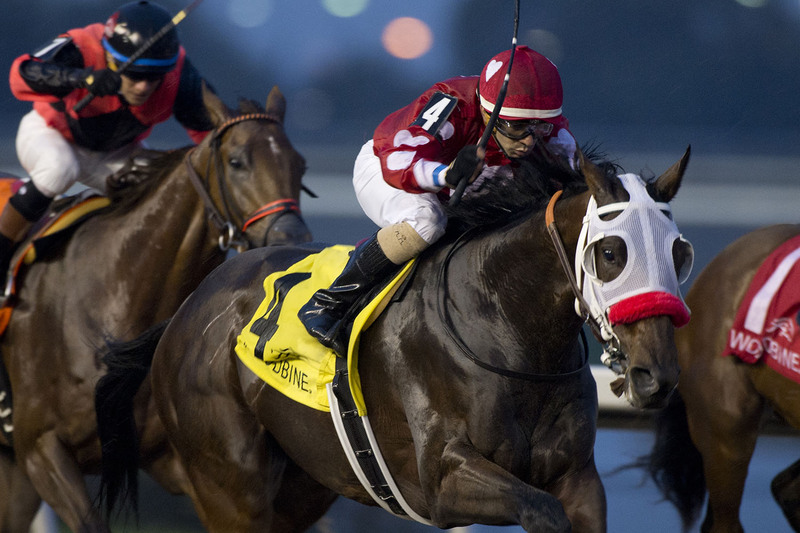 Seven Canadian Triple Crown nominees will face off in the $125,000 Queenston Stakes on Sunday, April 22. The seven-furlong sprint for Canadian-foaled three-year-olds features the season-debuting Aheadbyacentury and Silent Sting, who are among the top 10 winterbook favourites on the road to this summer’s $1 million Queen’s Plate, set for June 30. The Queenston Stakes, scheduled as Sunday afternoon’s eighth race (approximate post time of 4:53 p.m. ET), will kick off Woodbine’s exclusive Facebook Live programming for 2018 with host Jason Portuondo. The network-style show will go live on Woodbine’s Facebook page, Facebook.com/WoodbineTB, at 4:30 p.m., and will include highlights, live race coverage, live interviews and much more. Fans can send in questions and join the conversation on Sunday at 4:30 p.m.
Aheadbyacentury went two-for-four last year, capping off his two-year-old season with a November 5 stakes victory in the $225,000 Coronation Futurity over 1-1/8 miles. Bred by Hill ‘N’ Dale Farms, the three-year-old Midnight Lute-Sinful colt is trained by John Ross for his J.R. Racing Stable and Jack of Hearts Racing. “We finished up the year winning the Coronation and we sent him down to Florida at Payson Park and he trained there,” said Ross. “We gave him a month or so off and he started training the first of January. I left him under the care of a trainer that I know well, John Hennig. I just popped down there a couple of times in the winter months and let him handle the horse while he was there. Ross reported that Aheadbyacentury has matured into a big, long-legged horse, which will benefit him as the season progresses and he stretches out in distance. The Queenston is part of Ross’s ideal plan to set Aheadbyacentury up for the Queen’s Plate. His perfect scenario would include running in the Plate Trial Stakes over 1-1/8 miles on June 9 before the million-dollar test over 1-1/4 miles. Rafael Hernandez, who worked out the winning trip in the Coronation Futurity, will be reunited with Aheadbyacentury for the Queenston. Like Aheadbyacentury, Silent Sting also closed out a four-race freshman campaign winning for the second time, in the $125,000 Kingarvie Stakes over 1-1/16 miles on December 9. Sid Attard trains the Silent Name-Mona Mia colt, who was bred by Phoenix Rising Farms, for Stronach Stables. Eskiminzin is another Queenston Stakes contender who will be making his first start since winning the Simcoe Stakes last August. Last year’s Victoria Stakes winner Blueblood returns to Woodbine for trainer Mark Casse after kicking off his sophomore campaign with a fifth-place finish going one mile on the turf in the Columbia Stakes last month at Tampa Bay Downs. The field also includes the season-debuting Sable Island and Wandofuhr, both winners at Woodbine last year, as well as the Simcoe Stakes-placed Ellas My Love, who hit the board in his first start of the season last month in a seven-furlong Gulfstream Park allowance. Live Thoroughbred racing returns to Woodbine to start the 2018 meet on Saturday, with a 10-race program featuring the season debut of Pink Lloyd in the $100,000 Jacques Cartier Stakes in addition to the $100,000 Wando Stakes. First race post time on Saturday and Sunday is 1 p.m.
Woodbine will be offering a Queen’s Plate Festival ticket promotion over Opening Weekend, with 20 per cent off the price of all festival passes. Tickets can be purchased at the New Player Zone on the second-floor grandstand from 11 a.m. to 11 p.m. on Saturday and Sunday. The complete field for the $125,000 Queenston Stakes is listed below in post position order. For more information, visit Woodbine.com. This entry was posted in Woodbine News and tagged 2018 Queen's Plate, Aheadbyacentury, Horse Racing, John Ross, Opening Day, Queen's Plate, Queen's Plate Festival Event, Queenston Stakes, Woodbine. Bookmark the permalink.